World War II was a turning point for women. Before the war, few married women had jobs – in fact, most men considered a working wife a shameful sign that he couldn’t provide for his family. Unmarried women found few careers open to them, namely in nursing, teaching, and as secretaries. The war changed that. In 1940, 132 million people lived in the US. and during the war 11 million men and women served in the armed forces. Even if the economy had continued at pre-war levels, this would have represented a significant drop in the workforce. But US production skyrocketed to supply planes, ships, guns, ammunition, uniforms, and food for the Allies. Women needed to work for the sake of their country. More nurses were required, and 67,000 women joined the Army Nurse Corps and the Navy Nurse Corps. Nurses also expanded their traditional roles. Five hundred women served as flight nurses when the Army Air Force pioneered medical air evacuation. Each evacuation flight was staffed by a nurse (an officer) and a male surgical technician (a technical sergeant). She outranked him. She gave him orders. And without a physician on board, she made the decisions in flight. These were revolutionary roles for women. Women were also recruited into the military. Two hundred thousand American women served as WAVEs (Navy), WAACs (Army), Spars (Coast Guard), or in the Marines. By placing women in noncombat positions, more men were available for combat duty. “Free a man to fight” was the slogan. Also, 19 million women in the United States followed Rosie the Riveter’s example and took jobs, a third of them in factory work. 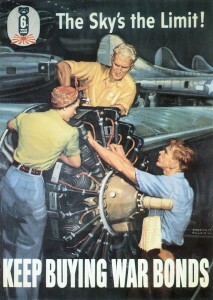 By 1943, women formed one-third of the civilian workforce. While they faced opposition on the job site and in society, they proved themselves able workers. In fact, some jobs benefitted from women’s smaller fingers and attention to fine detail. While the 1940s woman went to work for the sake of her country, she found unexpected personal benefits. She learned she could do things she never thought she could do. She earned her own money and discovered the freedom that gave her. She found satisfaction in her work. This is a lesson today’s woman has learned well. All of us who have a career outside the home – full-time, part-time, or for a season of life – owe a lot to the nurses, WAVEs, and Rosies of World War II. This has been an exciting week for me, with A Distant Melody now in stores, and now the cover for A Memory Between Us. I thank all of you – family, friends, and new e-buddies, for your support, encouragment, and prayers. There needs to be an asterisk after my name on the cover to include all of you, because I couldn’t do it without you! When World War II began, women sprang to action as volunteers. This was an area in which women already excelled. For example, my hometown’s Women’s Club was founded in 1902. In the early years, they were responsible for raising funds and spearing drives to establish the town’s library, high school, street signs, house numbering, street paving, water delivery and sewage systems, and the planting of shade trees! Nowadays, we glorify the wartime woman who went to work outside the home, but in reality, far more women served as volunteers, and their work was crucial to the war effort. Church groups, women’s clubs, the PTA, the USO, and the Red Cross all performed important services for the country. Women raised funds, bought war bonds, planted Victory Gardens, gave blood, ran recreational centers, and even knitted socks for the troops. The American Red Cross, for example, had 37 million members during the war, and raised $785 million. In addition, 20 million youth joined the Junior Red Cross. They shipped 13 million pints of blood to the military and shipped 300,000 tons of supplies overseas, both for the troops, and for civilian wartime relief. Red Cross volunteers rolled bandages, ran blood drives, and made clothes for refugees and kit bags for soldiers. They served in hospitals as “Gray Ladies,” reading to the wounded, writing letters, and serving in the recreation rooms. They operated canteens to serve meals at train stations, docks, and military posts at home and abroad. They served as nurse’s aides and dietitian’s aides. To the 1940s women, community mattered. She willingly gave up her time to volunteer for the sake of her country. And she accomplished amazing things. In 2010 we live in a self-oriented culture rather than the civic-minded culture of the past. Despite political talk about a return to volunteerism, most civic organizations and churches struggle to find people willing to commit time to serve, and most of the functions they once performed have shifted to government. These women inspire me, and I hope they inspire you too. What can you learn from them? How can you contribute? Rosie the Riveter is the icon of World War II women – strong but feminine. She’s got biceps, but she curls her hair and does her nails. She can do a man’s work, and don’t you dare tell her she can’t. She is woman; hear her riveting gun. Today I’m starting a series of posts on lessons we can learn from the women of the 1940s. 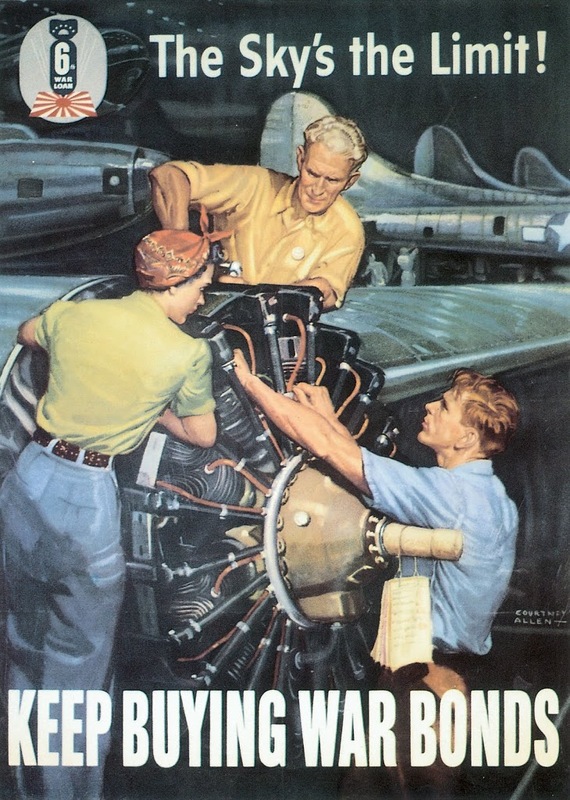 The World War II time period was a pivotal time for women, a hinge between the traditional home-based women’s role and the modern career-based role. Wartime posters show the fullness of a woman’s place in society and reveal the values that drove this generation to victory. Through these posters we’ll see lessons we can learn from women of that era: be involved, be productive, be thrifty, be supportive, love your family and home, and have faith. What do you admire about women from the 1940s? To some extent, we all want to do great things, and as Christians, we want to do great things for God. The further we travel, the more we spend, the deeper the sacrifice, the more people saved—the better. We look up to people who do those big things for God. Then we look at what we do. It seems so small. So trivial. And no one notices. Naaman had that attitude. In 2 Kings 5, Elisha told him to wash in the Jordan River seven times to be cured of his leprosy. Take a bath? That’s all? It wasn’t big enough, and Naaman reacted in anger. But his servants said, “’If the prophet had told you to do some great thing, would you not have done it? How much more, then, when he tells you, “Wash and be cleansed”!’” (2 Kings 5:13). Then Naaman did the little thing God asked, he was healed, and God was glorified in a big way. We may not see the result of our service, but God does. If you’re serving the Lord, doing what He asks you to do—big or small—never allow yourself or others to minimize it. The smallest light can have a mighty impact. This challenge came from our Christian radio station – to find a personal theme word of the year. I already had it. While I cringe at the idea that the Lord is bound by our calendar or that He communicates with everyone the same way, the past few years He has given me words, concepts that He impresses on me. First it was “holy” as He taught me about His holiness, and then it was “grace,” both His for me and the grace I’m to show to others. I want to bear fruit. I want to write and speak powerful words that teach people about the Lord and help them grow. I want to have a deep and positive impact on the people in my life. But sometimes I get too wrapped up in the fruit-bearing…and neglect the Vine. How stupid is that? How can I produce any good work for the Lord without Him? I can’t. And I don’t want to. This year – and for the rest of my life – I want to concentrate on abiding in Jesus, attaching myself to my only source of life, of power, and of creativity. How about you? Do you have a “word of the year” or something God is trying to teach you? Most of us have a mental image of the ideal believer—shiny-faced, unquestioning, always good and cheerful and obedient. So what about those who struggle and grumble, doubt and disobey? Sometimes God blesses them and makes nations out of them. Jacob was no model of godly behavior. He lied and cheated and deceived. Talking to his father, Isaac, he referred to “the Lord your God.” Fleeing from his furious, betrayed brother Esau, Jacob made a brazen bargain with God: “’If God will be with me and will watch over me on this journey I am taking and will give me food to eat and clothes to wear so that I return safely to my father’s house, then the Lord will be my God’” (Genesis 28: 20-21). Twenty years later, Jacob returned home, laden with wives and children and flocks, and on the way, he physically wrestled with the Lord. And God told him, “’Your name will no longer be Jacob, but Israel, because you have struggled with God and with men and have overcome’” (Genesis 32: 28). Only then did Jacob acknowledge the Lord as his God and build an altar to Him. The name Israel means “he struggles with God.” The Lord chose this God-wrestler to be the father of a nation and to bless all the nations through his descendant Jesus. Perhaps we should alter our mental image of the ideal believer to include those who struggle with God, ask the hard questions, take doubts to Him—and overcome. How about you? Wrestled with God lately? My name is Laura Wrede and I have been writing for Examiner.com as a Travel writer for some time and was recently assigned the “National Women’s Ministry” column due to my education and experience (but most of all, I believe…God’s directing). I feel I have been allowed the unique opportunity to take advantage of writing for a secular publication (with over 7 million readers and climbing) and offering a place where woman, who follow my column, can share their Christian worldview (this gives them a larger voice than a personal blog might). I am creating a “guest spot” for authors and writers where I will highlight their work, ministry, and thoughts on what is relevant to today’s Christian Woman. If they have a personal website or blog, I would include a linkback in the source section. In general this column is for all women who want to share their comments and be part of a larger online community where not everyone is Christian (a good testimony opportunity). The way that examiner works is by popularity. The more people who look at the articles, subscribe and comment, the more popular that column is. The more popular…the more often it is found on the home page- page one where all see it, not just Christians searching for Christ focused reading. What an amazing witness opportunity! Right now, the most read (popular) columns on examiner.com in the “Religion category” under “Lifestyles” are the Atheist columnist and the Humanist columnist! I want to change that! And I need women like you to show the world that God is still alive and well and flourishing in the US. As Christians, we tend to stick to Christian publications, but miss the opportunity to give voice to our faith among the world! 1. Subscribe and follow the articles and Twitter them. Invite all your social contacts, friends, family, church members, etc. to do the same. 2. Comment on the content so that others can benefit from your point of view. 5. Suggest a story of someone you know that would be an inspiration to other women in their faith (emailed to me). 6. Put a link to the column on your blog with a little blurb and invite others to subscribe. I can only reach out to others, tell them about the opportunity, write what I beleive God wants me to share in the articles, and answer emails. I cannot do this alone, but together we can do it. Does this sound like something you would be interested in? If so just pass on the instructions and link to others…spread the word and email me if you have any thing to share. Here is a link to one of my articles to check out. Thank you so much for your interest and help in spreading the word. I look forward to hearing from you. The whole world is devastated by the news from Haiti. We can’t fathom the suffering and loss of life piled on top of the difficulties this impoverished nation already endures. I wanted to show you the faces of Haiti – before the quake – so we know who we’re praying for. Each year my husband, Dave, goes to Haiti with a group of men from our church to help with construction at a village school which also feeds hundreds of orphans every day. He’s grown to love these people deeply. These people are more than dust-covered faceless victims – they are God’s beloved children. Look at these faces. Pray for these people and countless more like them. And pray for God to perform a mighty work in this country. These quotes from two marriage and family experts appeared in the article “’Fess up or Fib?” by Jessica Yadegaran in the Contra Costa Times on January 6, 2010. Which expert is right? Lying is so easy. If I lie about my mistakes, I avoid the consequences. One little white lie about a friend’s new outfit and I make her happy. Conceal a purchase from my husband and he won’t lecture me about my spending habits. A well-told lie can make life feel smooth. But lying becomes a habit. We feel more comfortable making mistakes, knowing we can talk our way out of them. Underlying issues grow in magnitude as necessary conflict is put off. Then we’re caught in a bald-faced lie, and trust is shattered. And trust shattered is not easily glued back together. Truth is hard. But truth is right. Truth means owning up to our mistakes. Truth means finding a creative way to compliment a friend even if we don’t care for her fashion sense. Truth means opening up to those we love, exposing ourselves to the pain of conflict—and to growth. Let’s look to the only Expert who matters. God never condones lying, even little white lies. Rather, “The Lord detests lying lips, but he delights in men who are truthful” (Proverbs 12: 22). The story of Jacob and Rebekah deceiving Isaac for his blessing shows the disastrous results of lying—anger, threatened murder, and a family fractured. As in most things, God calls us to the difficult road. Truth requires humility, creativity, and hard work. But it’s always worth it.